On June 6th we had the pleasure of attending the first ever rallycross put on by the Kitchener-Waterloo Rally Club. We were absolutely blown away by how smoothly the event was run, and how technical and fun the track was. A massive thanks to everyone who made this event happen. Kitchener-Waterloo Rally Club Rallycross Is A Go! 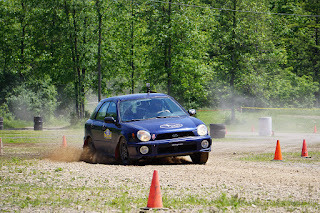 After months of planning and a couple unfortunate reschedules, the KWRC Rallycross is finally happening this Saturday June 6 at the Agricultural Society in Rockton, Ontario! The course looks absolutely fantastic - probably the longest rallycross course we've seen, and the entry list is full of very competent drivers and a few stage rally cars. It feels a bit intimidating but really exciting. The car has been running like a champ with the new motor, hopefully there won't be any surprises. The gravel tires are mounted and ready to rock, though admittedly we've never tried them and have no idea what grip levels to expect. Should be an interesting day indeed. Come cheer us on - we'll be numbers 8 and 23. Entry is free for spectators and grandstands will be provided.